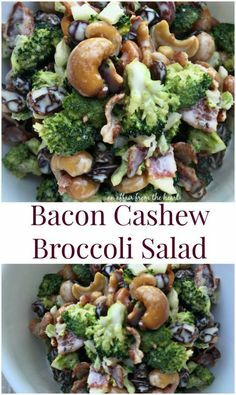 Delicious broccoli salad filled with bacon, raisins, and cashews - covered in a sweet dressing. Place broccoli in a large bowl. Add onion, raisins and nuts, toss. In a small bowl mix dressing ingredients until sugar is dissolved. Pour dressing over the salad, toss to combine. Add in bacon toss again. Serve room temperature.